In this post we want to share the process from beginning to end that leads the execution of a design project and 3D printing in Bitfab. We have chosen as an example the work done for the company UTW (Unmanned Technical Works), dedicated to the use of drones to carry out engineering projects. UTW needed a way to fix the Parrot Sequoia multispectral camera to one of its drones to carry out the project of inspection of a public work. Due to the characteristics of the work and the short term that was available, none of the commercially available supports were adjusted to their needs. 3D printing is the perfect technology to make this type of unique pieces, components adapted to the client within a few days. 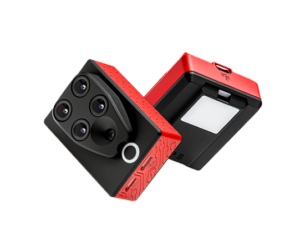 The support to be designed must contain the Parrot Sequoia camera, a professional multispectral sensor that is used to monitor agricultural operations and infrastructure. This type of sensor is mounted on drones to capture images in 3 different bands of visible light and an infrared band and obtain information on the condition of crops and structures that are inspected. The Parrot Sequoia+ multispectral sensor is revolutionising the sector, offering a comprehensive, adaptable solution that is compatible with all types of drones. With its two sensors, multispectral and sunshine, Parrot Sequoia+ analyses plants’ vitality by capturing the amount of light they absorb and reflect. Collecting this data means that farmers can do what’s best for their fields. The objective that the support must meet is to hold the camera securely and allow it to be attached to the drone’s chassis. The fixation is made directly to the carbon fiber frame in the slots dedicated for that purpose, and must allow the camera to take frontal images. The support is secured by a screw and a nut with a handle printed in 3D, so that the camera can be easily removed and put even on the ground. Want to know more about the camera? Here you can see what it is and how it is used in precision agriculture. The manufacturer provides basic external dimensions of the sensor. These measurements have to be complemented with measures of the physical object taken with the caliper. The design of the model was made with FreeCAD, a free CAD modeling software. Being a simple model, the work is done in one hour by one of our technicians. The design is carried out taking into account the position in which the piece is going to be printed and the particularities of the manufacturing technique (FFF 3D printing, Fused Filament Fabrication), so that the designer can optimize both the final finish and the resistance of the support. The result of this modeling process is the housing that supports the camera and the rest of the pieces that make up the whole of the support. The support includes several windows for both the sensor lens and the different connections it has. The containment of the camera inside the support is made by a lip on the front and a flange held by screws on the back. In addition, the camera is kept in position by the contact of the walls of the support, since the adjustment is very good between the two pieces. In addition to designing the object with 3D printing in mind, it is important to adapt the position and printing parameters to offer the customer the best result in their piece. 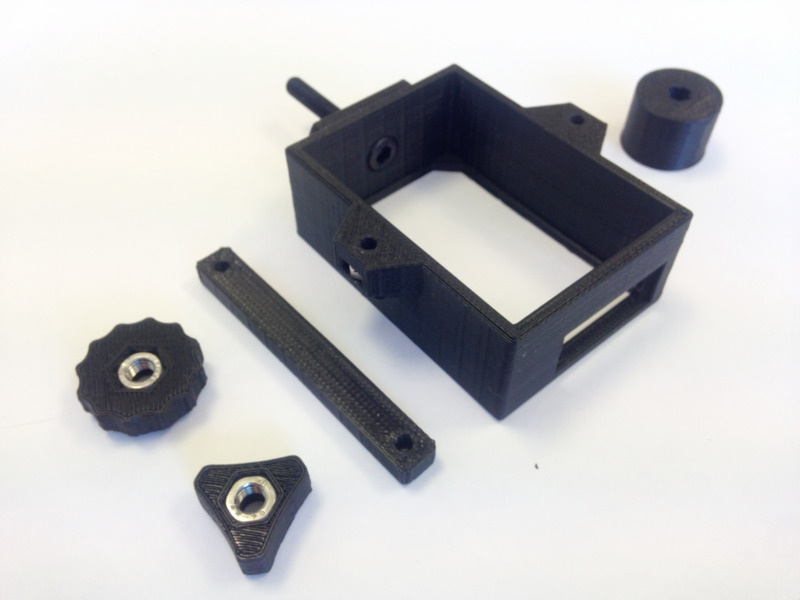 The support was printed on PETG, a printing material with very good mechanical properties, and solid printing was chosen, with 100% infill, for the high value of the camera it has to support. The assembly and testing of the printed pieces was also included in this project, so the set of pieces was assembled and tested with both the camera and the drone. In the review, the client indicated changes that were implemented in the next iteration of the design, which was the final one. 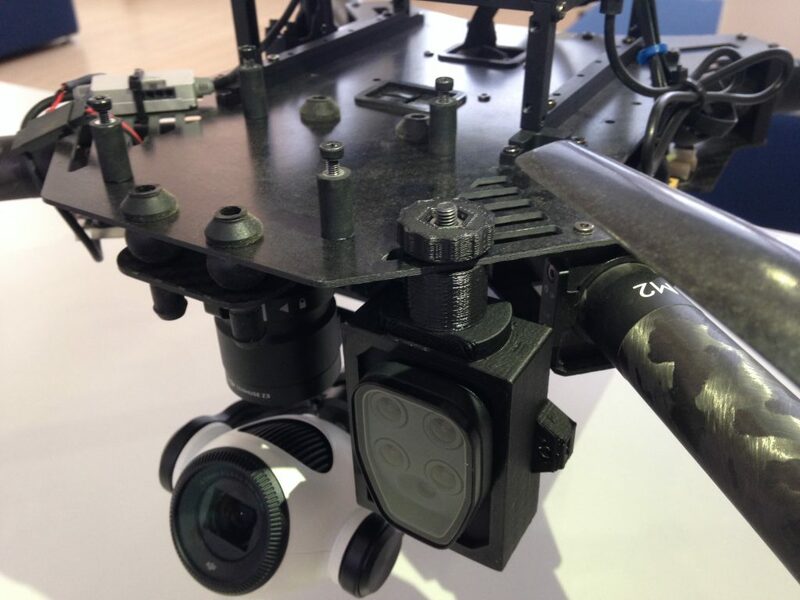 The complete set of the support includes the housing together with the flange (which holds the camera inside the housing), spacers (to adapt the camera to different heights) and several handles to tighten the nuts without the need for tools. The support was also tested mounted on the drone and has made several working flights taking pictures with the multispectral camera. The support allowed UTW to take frontal images of structures, a use case for which there are no prefabricated supports in the market, within 48 hours from the definition of the problem to the delivery of the final product.